The Doctor of Pharmacy program allows you to personalize your Pharm.D. to achieve your career goals, like community or hospital pharmacy, residency, missions and more. At Samford University's McWhorter School of Pharmacy, we are mission driven. We believe a career in pharmacy is more than a job—it’s a deeper calling to serve your neighbors, your community and the world. Our goal is to provide you with a unique and individualized education that allows you to graduate prepared to answer your calling to care for others through pharmacy. 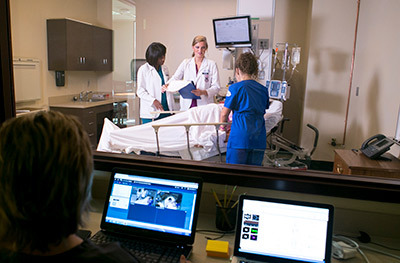 As a part of Samford’s College of Health Sciences, our curriculum is designed with interprofessional education at the forefront, reflecting today’s team-based approach to health care. You will learn alongside students in nursing, health professions and public health in our new College of Health Sciences facilities. We integrate certificate programs into our curriculum, providing you the opportunity to become certified in areas like medication therapy management and immunizations before you graduate. If you are considering a unique area of pharmacy practice, we offer electives in both the classroom setting and through Advance Pharmacy Practice Experiences, providing you the opportunity to gain valuable experience in a chosen area of pharmacy. You apply to McWhorter School of Pharmacy through the PharmCAS system. Admission to McWhorter School of Pharmacy is competitive and all applications are considered on merit. Additional requirements may apply for dual degree programs. We participate in the early decision program through PharmCAS, which is a binding option for applicants who have decided that McWhorter School of Pharmacy is their first choice pharmacy school and that they will enroll there if accepted. As an early decision applicant, you can apply to only one pharmacy degree program. In addition to completing the PharmCAS application, you must arrange for PharmCAS to receive all of your official transcripts and fee by Sept. 5, 2017. If your application, transcripts, or fee arrive after the deadline, PharmCAS will automatically change your file from early decision status to regular status. You may be offered early admission, denied admission or deferred to regular applicant status. Applicants admitted through the early decision process will not be required to submit a deposit to hold a seat in our program. If you are offered admission as an early decision applicant, you are obligated to accept the offer and you will not be permitted to apply to other PharmCAS institutions. If, however, you are denied admission as an Early Decision applicant, you may apply to other PharmCAS institutions for an additional fee. We will make admission decisions on early decision applicants by Oct. 20, 2017. Our Doctor of Pharmacy program allows you complete your degree within four years. Courses are provided in-person on Samford University’s campus in Birmingham, Alabama, and McWhorter School of Pharmacy follows the academic calendar for graduate programs in Samford’s College of Health Sciences. Is a PCAT score required? No. Effective August 2018, Samford University’s McWhorter School does not require the PCAT exam, and it is not used in the admission process. Is an ACT or SAT score required? An ACT or SAT is required. Unofficial copies are acceptable. This may be a copy of your personal score report, your high school or college transcript showing your score, or a screen shot from the testing agency showing your score. Official score reports are not required. Any applicant who has English as his/her second language and the applicant did not attend high school in the U.S. I will have earned an undergraduate degree prior to entering pharmacy school. How does that affect my application? Applicants holding an undergraduate degree from a regionally accredited college or university—or who will be receiving one prior to starting pharmacy school—and have completed all mathematics and science requirements in the prepharmacy curriculum will only be required to satisfy the Public Speaking and Elementary Statistics requirements. Is preference given to student from Alabama? No. State of residence is not a factor in the admission process. Our student body is diverse, including students from a variety of states and countries. Roughly 120 students are admitted each year.